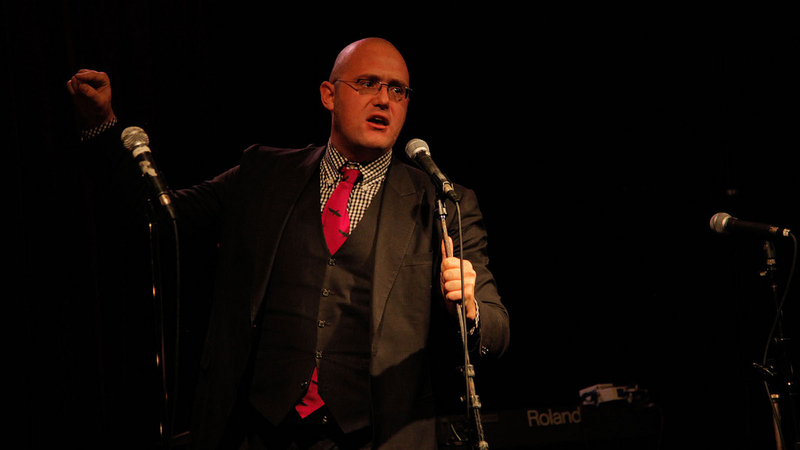 Brad Lawrence is an excellent storyteller, and hosts the Moth pretty much every chance he gets. He’s also got a podcast called “The Standard Issues” where he broadcasts storytellers that appear in he and Cyndi’s live show of the same name. And, since this is relentless show-promo week, I am obliged to mention that he’s performing at And I Am Not Lying, Live in Philadelphia next Sunday, November 6th — and at the Black Cat in Washington, DC tomorrow night! He told this story about the first and last pool party he’ll ever attend at Union Hall on October 5th, 2011. I may be bugging out a little bit. I may be bugging out a lot, I don’t know. I’ve got absolutely no sort of benchmark for this tingle arcing from my brain to my gut along my skeleton. Maybe if your skull could have a couple fillings in it and then chew on a ball of tinfoil the size of your brain you’d feel this way all the time — it might feel like that. All I know is that we’re bringing the And I Am Not Lying experience out to Philadelphia and Washington, DC next week and I’m both thrilled and terrified. What I’m terrified of, exactly, I have no idea. Maybe that nobody will come, or that EVERYBODY will come and my brain will restart onstage. It’s happened before. But honestly, I don’t think it’s going to happen again. I’m so excited to be doing a mini-tour (or at least two out-of-town gigs) that it’s going to go fine as long as I only have two drinks ahead of time. Three drinks and my accent comes out so hard that grits fly out of my mouth while I immolate in a blinding white flame of AWESOME. The show in Philadelphia is at L’etage on Sunday, November the 6th. Doors are at 7:30, show’s at 8. It’s $12 at the door. 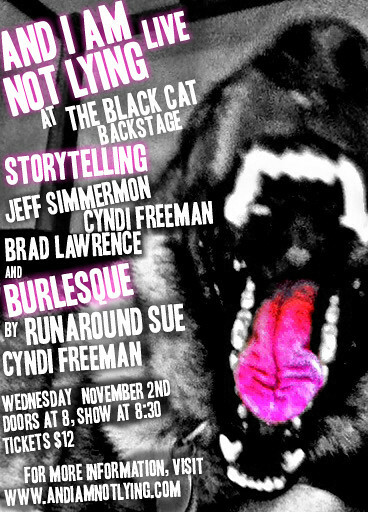 At the Black Cat on Wednesday, November 2nd. Doors at 8, show at 9. Tickets are $12, available here. If you’re new here, the show is this: storytelling by Brad Lawrence, Jeff Simmermon, Cyndi Freeman and in Philadelphia, the tiny legend that is ******. We’ll also have a few burlesque acts by Cyndi Freeman and Runaround Sue — and a comedy set by Philadelphia’s own Doogie Horner. I’d be lying if I said I knew Runaround Sue very well. I’d also be lying if I said I wasn’t a huge fan. She’s a burlesque performer here in New York and all over the place, including Richmond, VA and a lot of other states and countries. She’s a mystery lady, a sweet enigma that sometimes lives with Cyndi and Brad and sometimes coalesces in the back of used bookstores in Manhattan. That’s where I keep running into her. When she performed at our show at Union Hall in Brooklyn, she brought a terrifying heat. She grunted and yelped and when she beat the floor with her breakaway dress and the kind of bra that can NEVER come off fast enough, she did it with an intensity that you just kinda recognize after a while. It’s one part Cramps and one part playground and one hundred percent the spirit of ROCK. She’s going to be performing with us in Philadelphia and Washington, DC in the very beginning of November. Which is, sweet JESUS, next week! To learn more about the DC show, go here. Wasn’t that just wonderful? My family’s minister reads this blog. He’s pretty great that way, to be honest, and I’m glad to consider him a friend. I’m also glad that maybe Sue and I made him sweat a little much. 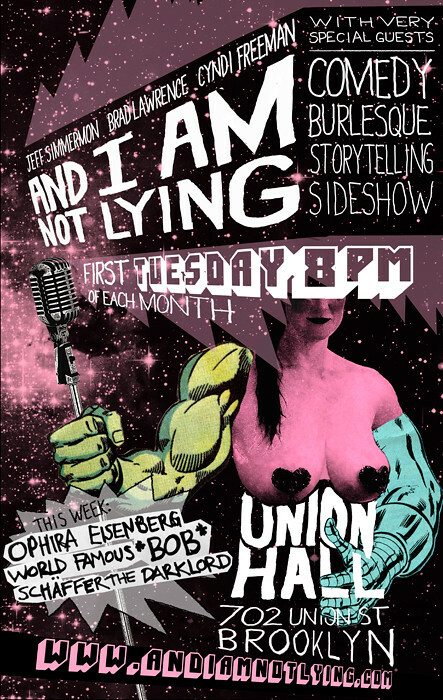 I’m incredibly excited about the show that we’re putting on at Union Hall next weekend — for any number of reasons, really. But one of the most exciting things for me about this variety extravaganza is that we’re featuring what promises to be an incredibly strange burlesque act from Mat Fraser and Julie Atlas Muz. Fraser was born with phocomelia of both arms, due to his mother being prescribed thalidomide during her pregnancy. As a live artist he was a member of the performance art group The DHSS in the early 1990s. He was included in Manuel Vason’s book “Exposures” and has performed at numerous internationally renowned venues. He received considerable critical acclaim for his one-man show “Seal Boy”. In 1999 he worked with the Hydra Collective on an event known as “Wrong Bodies” at the Institute of Contemporary Arts. As an actor he has performed with the “Graeae Theatre Company”, Europe’s leading disabled theatre company. He is the creator and main performer in a new play called Thalidomide!! A Musical. He also co-hosts the BBC’s Ouch! Podcast. Fraser has appeared on television both as a presenter and as an actor, in a number of productions including Metrosexuality and Every Time You Look at Me. He is also a martial artist having studied hapkido, taekwondo, Karate. Hotsy Totsy Burlesque is back after a 4 month break! I love this show. It is an ongoing burlesque soap opera with returning characters and plot lines. We’ve been doing it for 4 years.